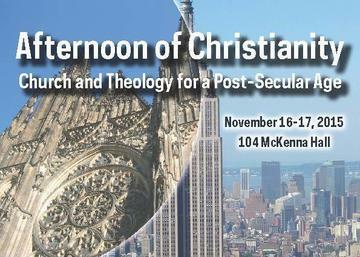 On Monday, November 16 and Tuesday, November 17, the Notre Dame Institute for Advanced Study (NDIAS) invites you to take part in “Afternoon of Christianity: Church and Theology for a Post-Secular Age,” a Templeton Colloquium led by Msgr. Dr. Tomáš Halík, 2014 Templeton Prize Laureate and Professor of Philosophy at Charles University in Prague. Tomáš Halík is in residence fall 2015 as a Templeton Fellow at the NDIAS. There is no registration, and the colloquium is free and open to the public. This colloquium brings together scholars from history, philosophy, political science, sociology, and theology to examine the crisis of modern Western Christianity and how its members can seek the path to a deeper, more credible and mature form of church, theology and spirituality. The sessions will take place in 104 McKenna Hall and will also be simulcast live on the NDIAS website. We also encourage you to review a pre-circulated paper written by Tomáš Halík. This colloquium is sponsored by the Notre Dame Institute for Advanced Study, with generous funding from the John Templeton Foundation. •10:45 am — Secularization: Divorce Between Christianity and Religion? •2:30 pm — Return of Religion as Threat: Is the Contemporary Political Theology a Sufficient Answer to Religious Fundamentalism and Extremism? Originally published by Grant Osborn ’06, ’09M.F.A. at ndias.nd.edu on November 04, 2015.